2014 was always going to be a hard act to follow! In it we achieved far more than we could ever imagine - including our first TV appearance on The Great British Bake Off: An Extra Slice, being pie experts on the BBC Sport website and our amazing 5th Birthday Pie-rty! But 2015 is already proving to be it's match, with our debut on BBC One as pie experts for Rip Off Britain and more recently being approached by Buzzfeed to write a football pie article for them next month! And the next step of this amazing blogging journey is to hit the bright lights of London and attend the Food Bloggers Connect conference in Chiswick House this Saturday! While unfortunately we were unable to visit for the whole weekend, there are a whole host of exciting sessions on Saturday that we're looking forward to attending. These include a "Monetise your blog" session and "Awesome Analytics" session, plus we're looking forward to contributing to "The Great Big Industry Ethics Debate", where the impact of blogging in the world will be discussed. Unfortunately I haven't spotted any pie makers on the long list of food suppliers attending this weekend, but I look forward to seeing what samples are available none the less. I'm also expecting plenty of time to mingle and network with other food bloggers, something I've only just started having the pleasure of doing. This will be my first FBC event and I'm looking forward to networking with other bloggers, getting some insight into google analytics and monetising our blog! Is blogging your full time job? If not, what is your day job and what do you get up to when you’re not blogging? Unfortunately pie blogging is not my full time job - but that's probably good for my waistline! However it's a full on hobby and great fun! In "real life" I'm an administrator and I love playing and watching sport. What first motivated you to blog and how has blogging changed your life? Four courses in one pie! 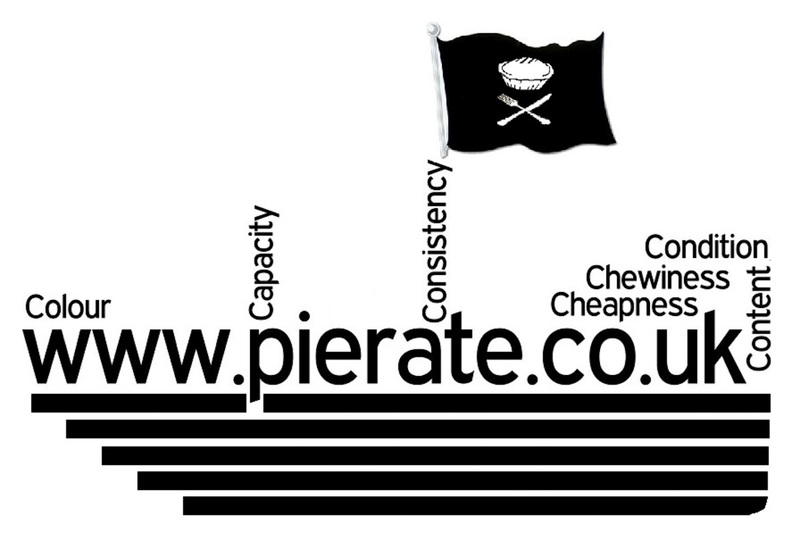 We're pie raters, rather than pie makers, here on Pierate Pie Reviews. However we do have a friend who occasionally posts original pie recipes and her "Four Course Dinner Pie" (four courses in one pie!) was actually amazing! How far have you travelled to eat pie? We've travelled all around the world looking for the perfect pie - though admittedly most of the reviews are from the UK! One place we'd still love to visit is America - perhaps some kind of American Pie Tour! If you could cook for anyone in history, who would it be and why? How is your lifestyle shaped by food? How is your lifestyle shaped by blogging? Does blogging shape your approach to food and what you eat now? My lifestyle and what I eat is quite linked to my food blogging, in that whenever I am in a new pub or a new town I'll often seek out a pie. Increased travel these days makes this easier. However pie blogging has led to me being on radio, BBC TV, meeting footballer Frank Lampard... it's been a great adventure! 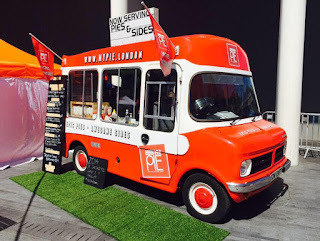 And if all that isn't enough excitement for you, this weekend in London will also include joining the guys who run the amazing http://www.pie-n-mash.com/ - a group of people who meet monthly to eat - you guessed it! - pie and mash at one of London's many pie emporiums and record in great detail the pie and mash consumed along the way! I'm hoping to get a few points in their league table for the pies I consume with them! Following that (and I hope I still have room for it!) I'll be meeting Pierateer Tim to rate the pies at The Queen's Head in Piccadilly, central London on Friday night. Looking forward to checking out their pie menu. And our London pie weekender will be rounded off on Sunday with a visit to see the provider of our sixth Birthday Pie Party pies (happening on 14th November) - Mr Chris Brumby. For those who don't know, Pierate Highly Recommended pie maker Chris of MyPie has his own converted ice-cream van from which he sells top pies in London and we're looking forward to getting our hands on his Steak and Ale pie! There will probably be a few cheeky pie party plans to discuss too!